Who Qualifies for VA Medical Benefits? If you're caring for a veteran, it's well worth looking into whether he or she qualifies for Veterans Administration (VA) medical benefits. While Medicare is a tremendously effective program, it still leaves up to half of an older adult's healthcare costs unpaid. It doesn't cover some services and supplies, and its deductibles and co-payments are hefty. For eligible veterans, however, veterans medical benefits can be one way to cover these unpaid expenses. A veteran eligible for care can receive it from any VA doctor or facility, but not all VA healthcare benefits are available to all veterans. The VA maintains a priority system, with the most benefits going to those with the greatest health or financial need. Another reason to choose VA care over Medicare-covered care can be cost. VA co-payments and deductibles are generally lower than Medicare's, including for prescription drugs. Some veterans qualify for both. Even if he's also enrolled in Medicare, your family member may qualify for the wide range of free or low-cost healthcare benefits provided by the VA. The VA provides healthcare through its own hospitals, clinics, nursing homes, pharmacies, and doctors nationwide. Who qualifies for veterans medical benefits can be complex, so the older adult you're caring for may need your help and encouragement throughout the application process. Veterans medical benefits are determined by a priority system. Anyone who served on active duty in the military may be eligible for at least some VA healthcare benefits. Someone who was in the reserves or National Guard may also qualify if he was called up for active duty. But the VA health system can't provide full care for all veterans. So the VA has set up a complicated priority system to determine veterans' benefits and out-of-pocket costs. The system divides veterans into eight groups, with the highest-priority groups eligible for the most services at the lowest costs. The priority groups are based on service-connected disability, other disability, and income. 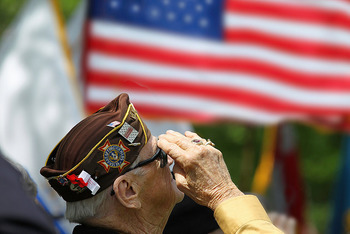 Veterans with severe service-connected disabilities get the broadest coverage; veterans with less severe service-connected disabilities, or other disabilities combined with low income, are given midlevel priority; veterans without disability or low income get the least VA care. Before you can find out what veterans medical benefits an older adult might be eligible for, he has to formally enroll with the VA The VA will then decide what priority group the veteran will be placed in and therefore which healthcare services he can obtain. Enrollment is free. You can help your veteran apply by obtaining an Application for Health Benefits form (VA Form 10-10EZ), available online. Or you can call the VA toll-free at 877-222-8387 and ask for a form to be mailed. To learn more about eligibility for veterans medical benefits, visit the healthcare pages on the VA website.